If you want, you may enter additional information as well as the data storages. Username and password may be entered if you synchronize a PST file and the directory requires an authorization. This may be the case for directories in the local network. 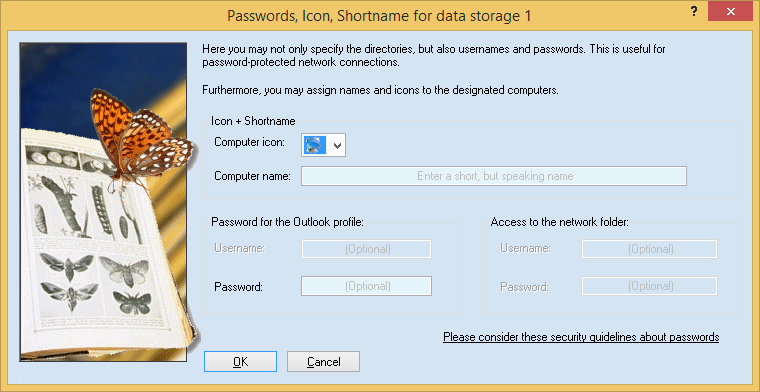 In addition, you may also enter a password for the Outlook profile or PST file. Windows often supplies the right username by default, so it may make sense to enter a password, but not a username. However, if you run Easy2Sync for Outlook as service (which normally runs under another user’s account), the network connection often requires a username. If you are unsure in this case whose name to enter, start the synchronization manually (without name / password) and look at the username that Windows suggests in the dialog box.